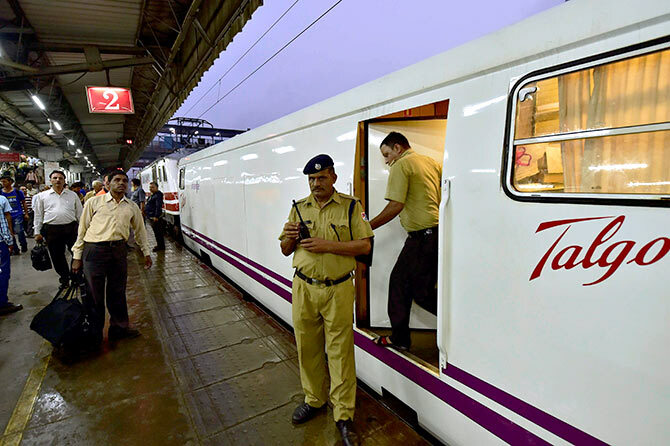 Rediff.com » Business » High-speed Talgo reaches Mumbai 3 hours late! The Talgo train runs at an average speed of around 90-100 km/hour and can attain a maximum speed of 130-150 km/hour. 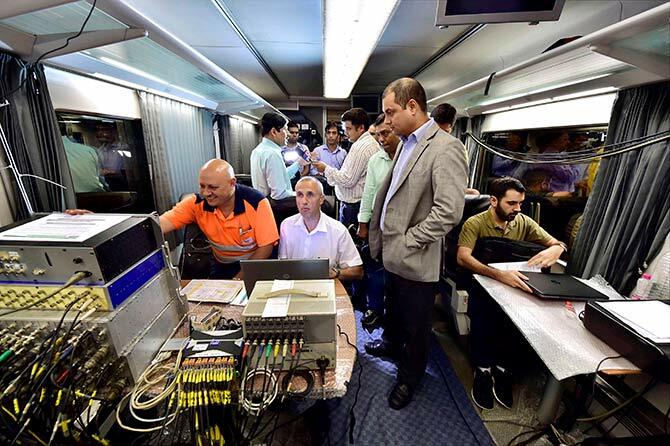 Spanish-made high-speed train Talgo on Tuesday completed its third and final phase of trials from New Delhi to Mumbai, but arrived at its destination over three hours behind schedule. The train had commenced its final phase trial run from Delhi yesterday at 7:55 PM and arrived in Mumbai today at 11.40 AM, over three hours behind schedule, a Western railway official said, adding that heavy rains enroute caused the delay. The semi-high-speed train was expected to complete the journey of 1,384 km in 12 hours and 35 minutes, and was scheduled to reach the metropolis at 8.31 AM. However, the train attained its maximum speed and the trial run at 130 km/hr was successful, he said. The light-weight train aims to cut short the time between the two destinations by almost four hours. Presently, super-fast trains such as Rajdhani Express take around 16 hours to traverse the route. The train consists of nine coaches, two executive class, four chair cars, a cafeteria, a power car and a tail-end coach for staff and equipment. Talgo all set to reach Mumbai from Delhi in less than 13 hours! Get ready for Talgo's high-speed trains!